From Erin: Jenny is kind of my muse. Everybody else thinks my ideas are okay or borderline bad but when I tell Jenny, she is always super into it. Then she adds a ridiculous twist that takes my ideas to a level that is bizarrely effective. If I could give her a different job title, it would be Camp Director. She is the type of person that you always want to talk to because she is always supportive of your feelings and ideas. My favorite memory of her was the day we realized that, due to lack of reading material in the bathroom, we both resorted to reading the instructions in the tampon box…in all the languages and have read them enough times to recite. Enough said. Jenny is awesome! From Lindsay: Jenny took the time to make me a beautiful CD case for my wedding songs. Not just an insert for a plastic case but an actual CD case out of cardstock! It really meant a lot that she would create something so special to commemorate my special day. Jenny is also the only person in the office who is constantly in a good mood. You rarely find people like that. She is one-of-a-kind and bright like a rainbow! From Jess: Jenny is always super fun to be around! She has an infectious good mood and has brightened my day many times. My favorite thing about Jenny is her “peanut butter muffins”. When hearing “peanut butter muffins”, most people naturally think, “okay, a regular Otis Spunkmeyer muffin”. Not Jenny! She actually means an English muffin with peanut butter on top! But when Jenny mentions her “peanut butter muffins”, we all know just what she means! From Emily L: I will miss EVERYTHING about Jenny! 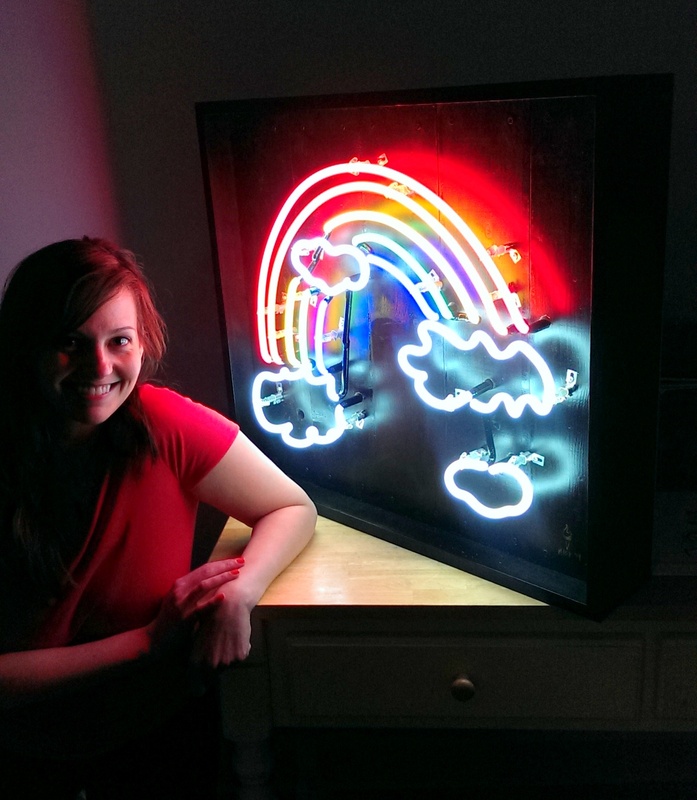 She is an incredibly creative, cheerful, and crazy woman with all kinds of wacky awesome ideas in her head. She is so much fun to be around because she is encouraging, not judgmental, genuinely caring, enthusiastic, cheerful, fun, and our resident goofball! My favorite thing about Jenny is that she is not afraid to be ridiculous. 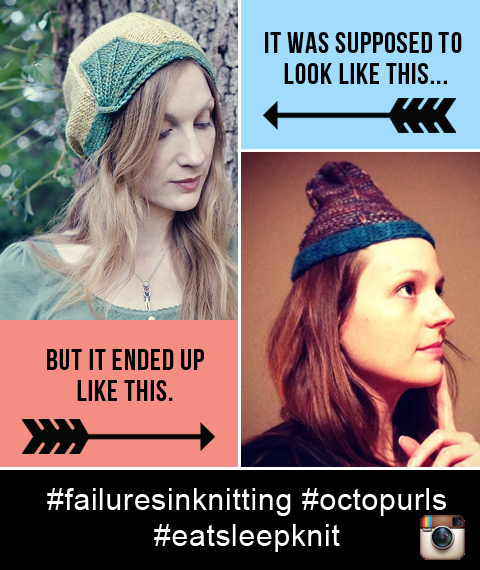 Embarrassing stuff happens to everyone but she sees embarrassing moments as fun stories…like in this great picture of one of Jenny’s adventures in knitting. It’s just a fact: I will miss Jenny adding to the weird charm of ESK! From Emily K: Though I only had the pleasure of sharing an office with Jenny for a few weeks, I immediately liked her! I mean, how can you not love someone who listens to books on tape while drawing an amazing cat knitting a unicorn’s tail? Aside from being an insanely talented artist, she has this big beautiful smile that is absolutely contagious! That smile was the first thing that welcomed me on my first day at ESK. 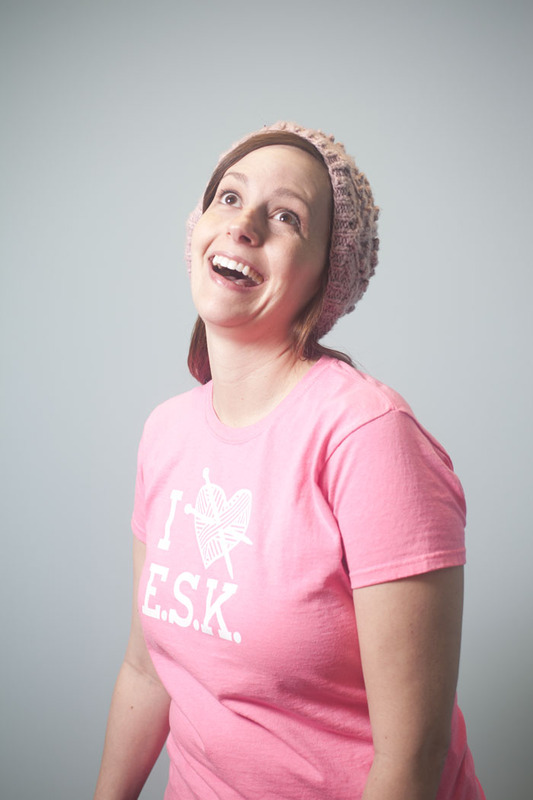 She is not afraid to be herself and, from what I’ve gathered while writing this blog post, Jenny has definitely made her mark on this office and the ESK community. I can’t wait until she flies back for Black Friday so I can get to know her better! From Tiffany: Jenny is an upbeat and friendly spirit! One thing I truly admire about Jenny is she is alwayds there to help support everyone in the office. Whether it is a good time or bad, Jenny never fails to be there with a kind smile and listening ear. I will definitely miss how she can put a smile on anyone’s face. Feel free to comment and share your favorite memories with Jenny at Knit Night, your favorite drawings, or bid her a loving farewell! But seriously, she’s not dying. Just moving. But we will miss her all the same! A couple of you have mentioned on Ravelry about the prizes for this quarter’s KAL, and I will admit that for a second I was all, “duh, I already posted that,” except, guess what, I didn’t! Sorry ladies, I totally flaked and thought this was posted with the original post. So, yes, each person who completes a team mascot KAL project this quarter will receive 1000 yards towards their individual total (limit one award per person). There is also a team prize – the team with the most members who knit a mascot project will get two additional virtual finishers to contribute towards their end of year totals (the Stitchosaurs won this prize in the first quarterly challenge). And, a secret bonus prize – anyone who completes a qualifying KAL project for all four team mascots (so, a monkey, an octopus, a robot, *and* a dinosaur project) will get a special treat from us in the mail just for being awesome. And before you ask, yes, if you find a way to incorporate all four mascots into one project, I will count that because, frankly, that sounds amazing. If you’re already ready to submit your project, I’ve gone ahead and opened the submission spreadsheet, but you have until June 30th to submit! *I also wanted to just mention that some of your responses did crack me up a little bit, because some of you phrase it so it sounds like some kind of gang! Things like, “once you’re in, you’re in it for life” – sounds almost threatening! You will love your 10K club or else! I know last week’s was a hard one; hopefully it was still fun! Last year, we gave away Yarnathon shirts to everyone who reached 10 miles – that’s 17,600 yards – of yarn, which ended up being 183 people! I know we said we’d credit a range of 5 on either side of the correct answer, but about 90% of you guessed within 10 versus maybe 5% who guessed within 5 so we decided to extend the range, because come on, that’s SO CLOSE! So everyone who sent in an answer between 173-193 has been credited and received an e-mail. Question #5 has been posted to Twitter and as always, you should submit your answers via the Google Form by Friday to receive credit! Oh, and the dog should probably be fine if you read on Twitter/Rav – she apparently has pancreatitis (!!) but they think her case is moderate and that she should recover fine with fluids and rest. I may need a similar amount of time to recover from the near heart attack she gave us. This week’s inspiration comes from our favorite place – you! 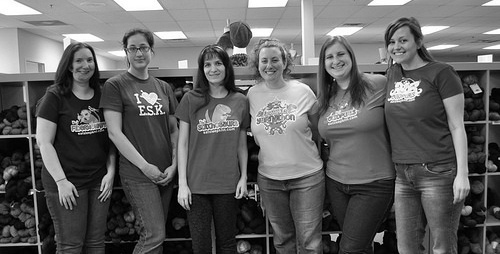 As your Q2 Team Spirit knit-a-long projects are being posted, we are reminded again about what a fun and creative group of customers we have. Stitchosaur Maryzona had an idea so great we wish we’d thought of it – using the outline from our free Stitchosaurs chart, she created a single-color beaded version and turned it into a wine cozy! Fiber Monkey Jubbers is another Yarnathoner with a creative streak – she knit up the Fiber Monkey’s team mascot chart and sewed it onto a tote bag! So great! Stitchosaur lallantonio knit up this friendly stuffed brontosaurus for her team project – we love the stripes! Still needing some inspiration? Octopurl widha decided to tackle a new technique at the same time and chose these stunning colorwork octopus mittens for her Q2 project, aren’t they great? And I can’t believe this her first stranding project! Looking forward to seeing more and more of your projects as the quarter continues!